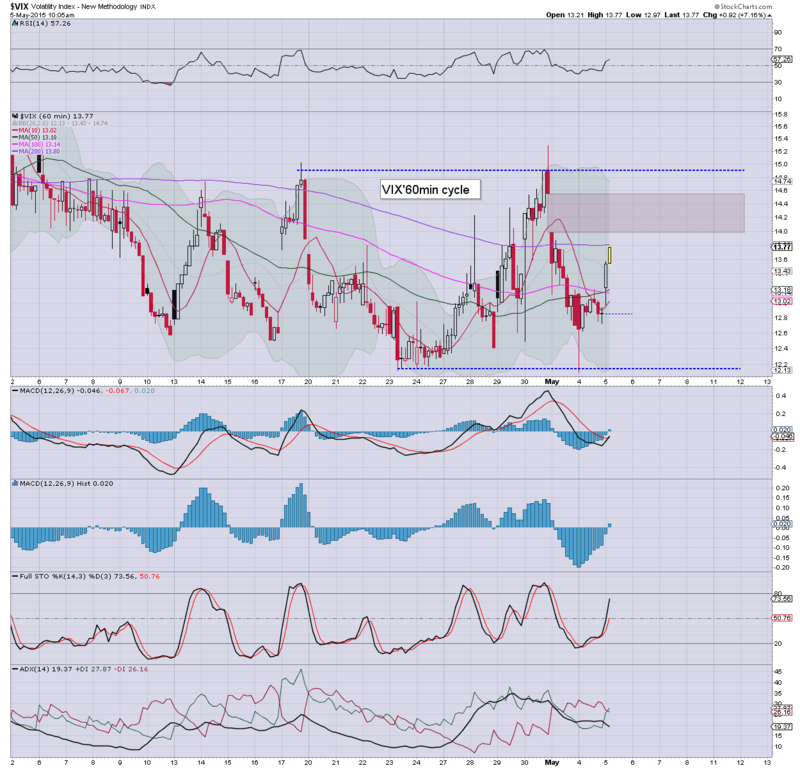 With equities slowly unravelling across the day, the VIX built sig' gains, settling higher by 11.4% @ 14.31. 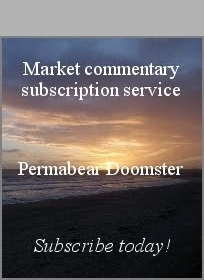 Near term outlook offers further equity weakness into the Friday jobs data, before the broader trend is likely to reassert itself. A second consecutive net daily gain for the VIX, although of course, the 14s remains a bizarrely low VIX. There are a great many aspects of resistance in the mid teens, and even if sp'500 slips into the low 2070s.. it will be difficult just to see VIX 17/18s. The big 20 threshold looks out of range in the current up cycle. Underlying MACD cycle is starting to tick higher, and at the current rate will turn positive in 2-3 weeks. For the equity bears... this is something to keep in mind for the latter half of May. US equities closed significantly weak, sp -25pts @ 2089. The two leaders - Trans/R2K, settled lower by -1.6% and -1.4% respectively. With the loss of the 50dma, next soft support is the recent low of 2077. Core support is the 200dma of 2027/28.. and then the giant 2K threshold. *closing hour tried to bounce... but failed. A pretty interesting day in market land. The mainstream is claiming that the market sold lower on the intl. trade data (since when did anyone care about that?) - which saw a wider than expected deficit of $51bn... but really, I think that is just a case of mis-attribution. We're clearly approaching the micro gap zone.. but further weakness tomorrow, and into the Friday morning jobs data looks probable. A bigger move <2072 in the near term looks really difficult to achieve. .. pretty interesting day, finally the bears look set to achieve some sig' net daily declines. I'm a little surprised we already reached the 2090/85 zone.. which seemed more likely tomorrow than today. *I continue to watch the Gold... but will hold off for today... another gap higher looks viable tomorrow. updates into the close. 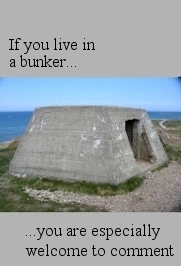 esp' if we fall <2085. 3.35pm... Hmm, sp' 2092... a minor up wave... but it'd seem another wave lower is due in the closing 5-10 minutes. notable weakness: DISCA -1.6%... after good earnings... but market still not happy as there are 'strong dollar' issues with this intl. company. US equities are increasingly weak, with significant declines for some indexes, notably the R2K and Nasdaq comp', both lower by around -1.5%. 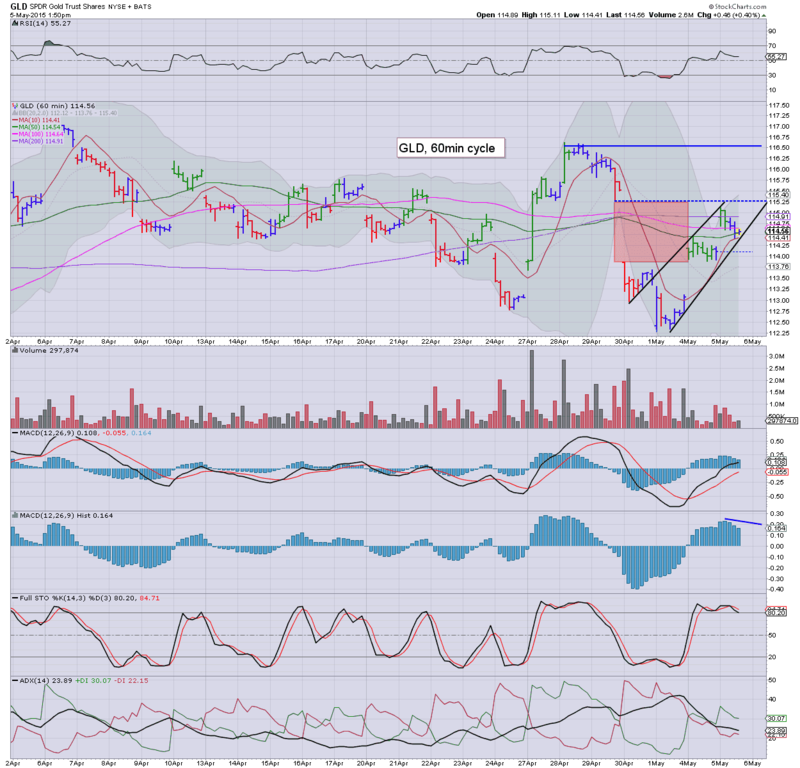 Precious metals are holding moderate gains, Gold +$4, but price structure is a very bearish wedge. Oil is holding sig' gains of 2.9%. *The metals remain broadly weak, and I'm considering shorting Gold via GLD. 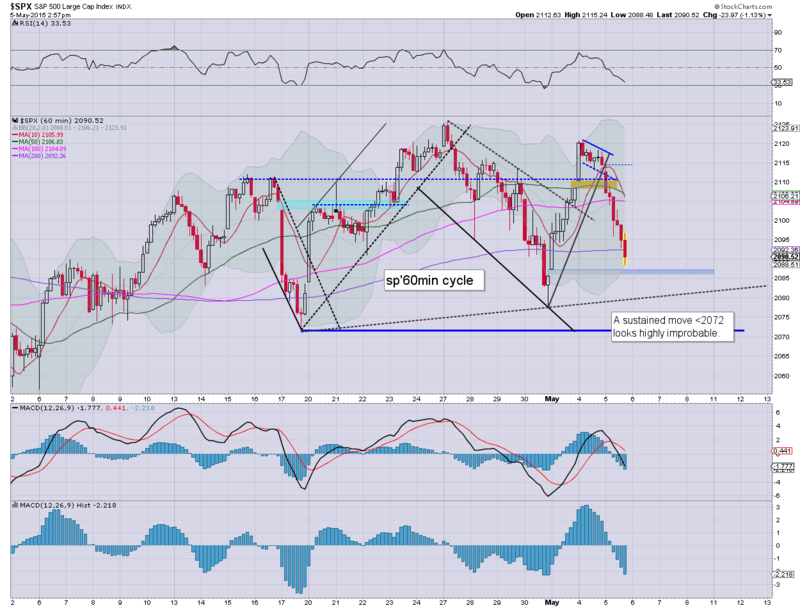 For now... its 'interesting' to consider viable downside into the Friday close. It looks like we'll close somewhere in the sp'2090/85 zone.. ahead of the ADP jobs report. As ever, VIX is without question still generally subdued.. stuck in the lowly 14s. I can't take VIX seriously until it can break/hold the low 20s.. and right now that looks highly unlikely in the near term. 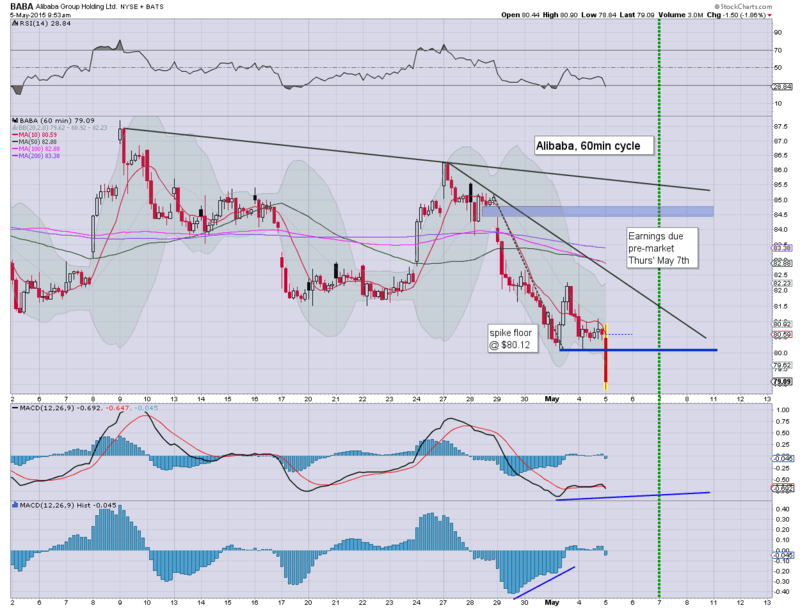 notable weakness: FXI (long China) -3.6%.. as market is pricing in another overnight decline. *it is notable that Oil faces the next set of inventory reports, with API some time after the close. US equities remain moderately weak, and for once... a latter day recovery looks increasingly unlikely. 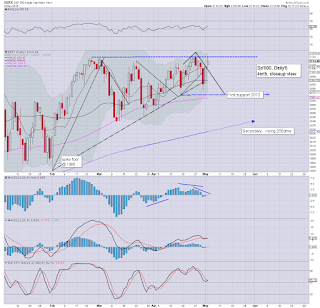 Next downside target is the sp'2090/85 zone... and is certainly viable tomorrow morning. Metals are cooling from earlier gains, Gold +$4. Oil is holding sig' gains of 3.1%. Underlying MACD (blue bar histogram) on the hourly equity cycle is now negative.. and looks headed lower into tomorrow.. and probably Thursday too. Things really only get 'marginally interesting', on sustained action under 2072.. but right now, that looks out of range, even if the market doesn't like the Friday jobs data. Next support is around $74... and that sure won't help TWTR.. which is increasingly subdued...melting toward the Dec' low of $34s. 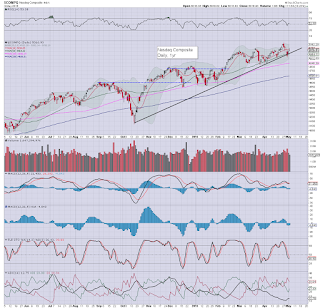 The sp'500 has lost the 2100 psy' level, and now looks headed to the 2090/85 zone.. where the 50dma is lurking. 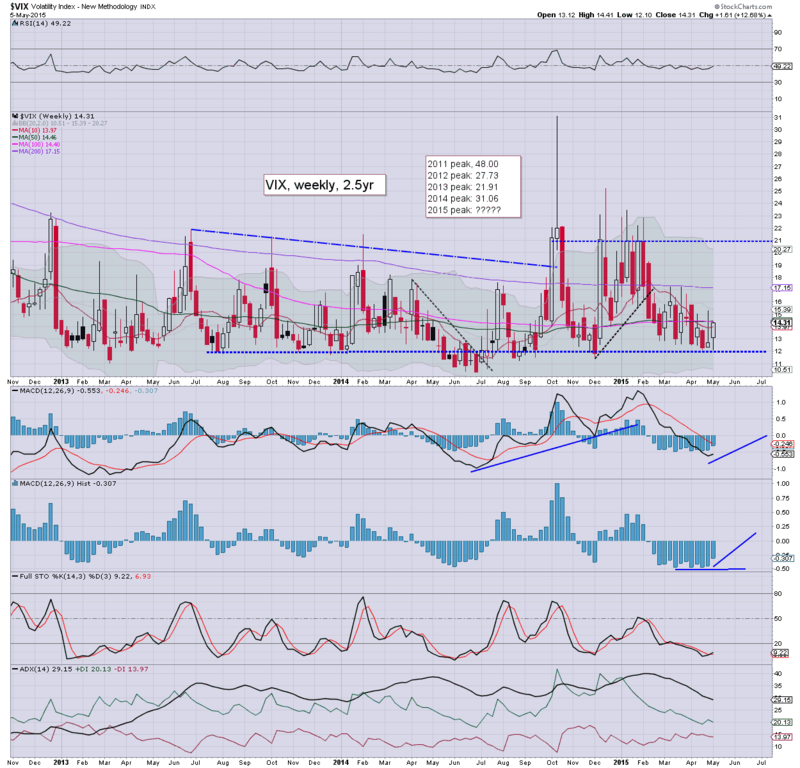 VIX is on the rise, +9% in the low 14s. Precious metals are holding moderate gains, Gold +$6, with Silver +1.1%. Oil continues to battle upward, +3.3% in the $60s. 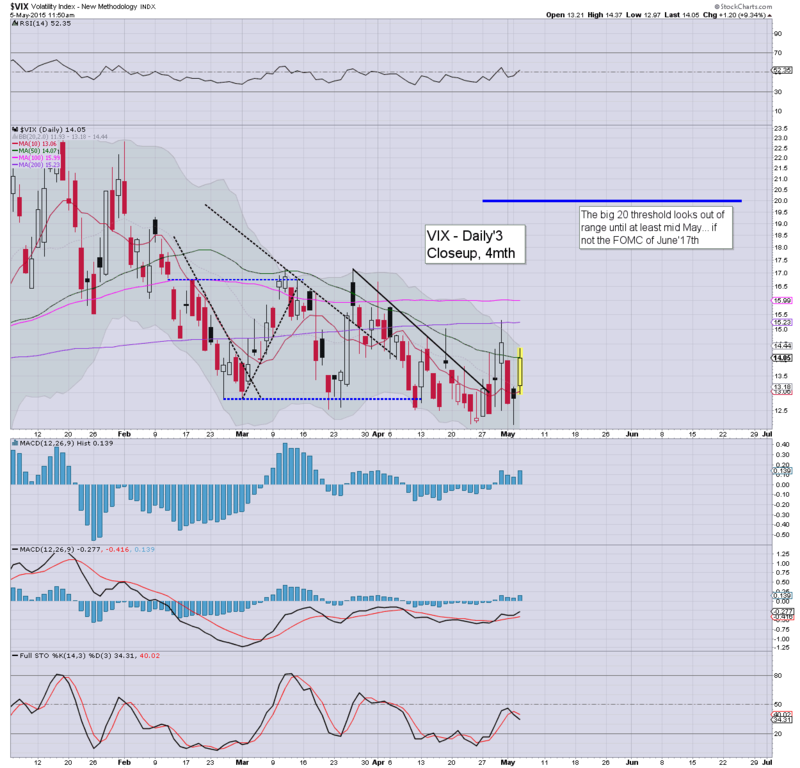 *VIX is naturally stuck at the upper gap zone resistance.. it will be difficult to break/hold much above 15/16. The bigger weekly cycle is threatening a major problem in about 2-3 weeks.. but for now.. its still trapped within a narrow range. So... we're on the slide, but as ever.. the declines are not significant. It would seem the market wants to fall into the Friday jobs data.. and then climb after. airlines, DAL/UAL, both lower by around -2.5% as Oil prices rise. strength: SDRL +11.9%.... as the energy chasers pile in. 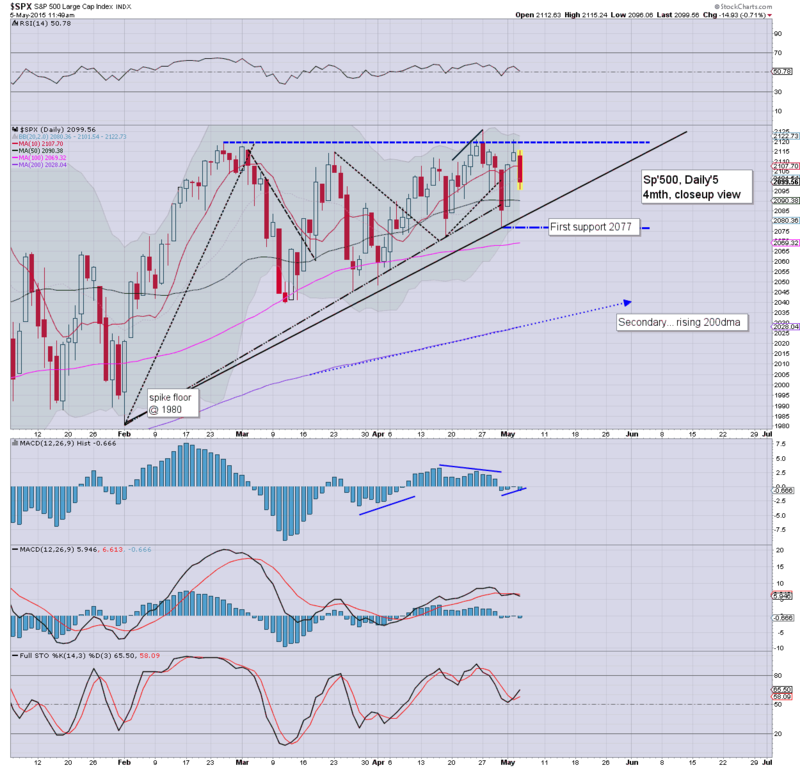 Equities are seeing some moderate weakness, with the Monday baby bull flag having failed. 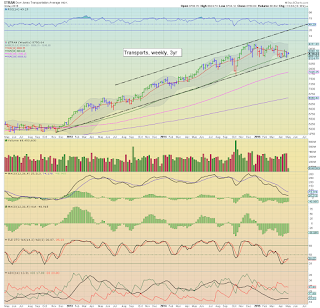 Mr Market is offering the threat of continued downside to sp'2090/85 zone, where there are multiple aspects of support. Metals are holding gains, Gold +$8. 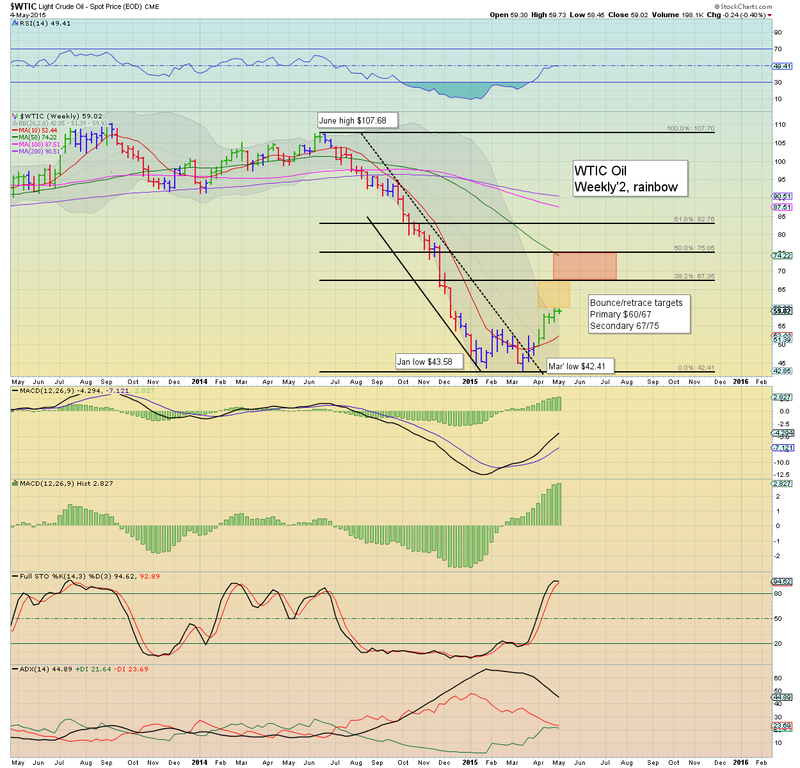 WTIC Oil is holding the $60 threshold, +3.1%. 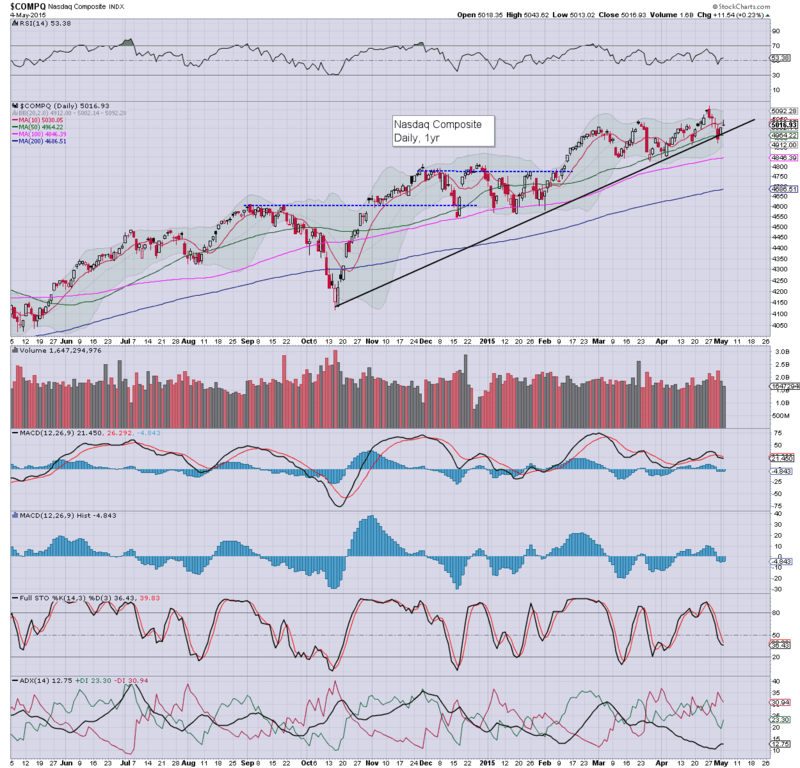 *as I will continue to note.. broader trend remains bullish... but hey... I realise some will be getting overly excited at this morning's weakness. So.. moderate declines, but really, its the same old nonsense. Companies will be buying their own stock this morning.. as they did yesterday.. and as they'll do tomorrow. Meanwhile.. BABA continues to unravel.. already breaking into the $77s. No doubt the mainstream will give BABA a lot of coverage this Thursday (for earnings)... but by then.. the stock could be as low as 70/68... right back to the IPO level. 11.23am.. sp'2098... so.. we're headed for 2090/85 it would seem. Weakness into the jobs report.. and then ramp after.... probably. Whilst the broader market is seeing some minor weak chop, there is notable weakness in Alibaba (BABA), which has lost the critical $80 threshold. 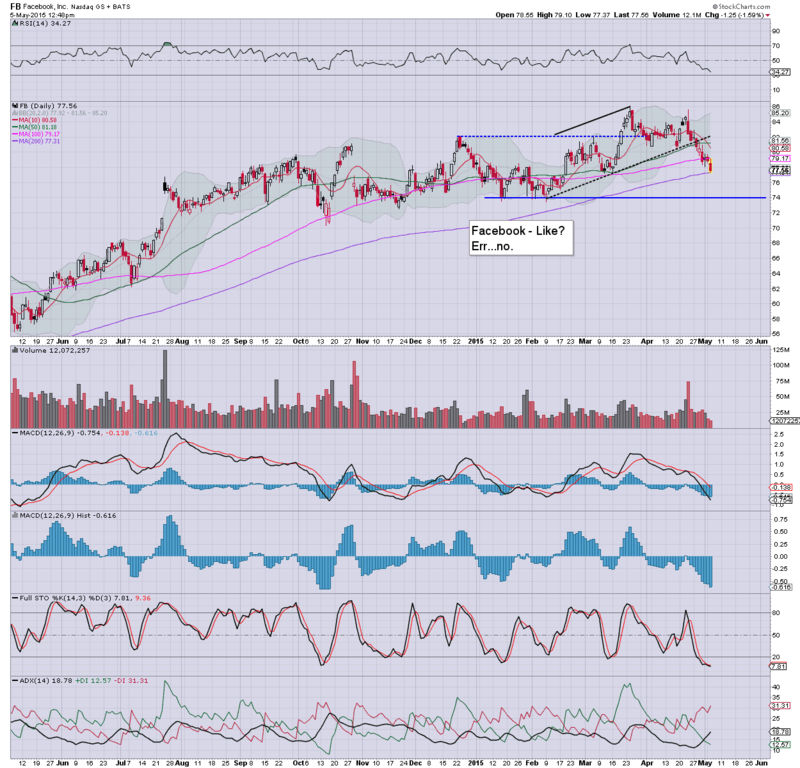 With earnings due early Thursday, from a pure chart perspective, outlook is now seriously bearish to 70/68. 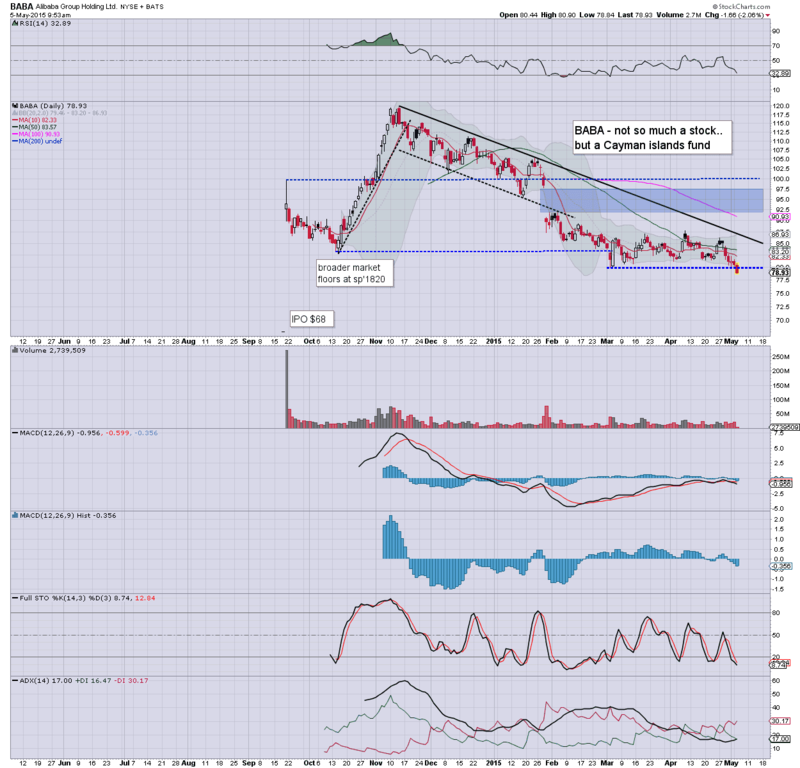 *I've no position in BABA, was considering it, but with the loss of $80, it is completely off the viable long-list. 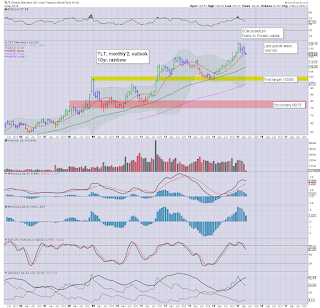 DIS, early gains to $114.77... but cooling... is Mr Market going to sell this one lower on good earnings, as it did AAPL? 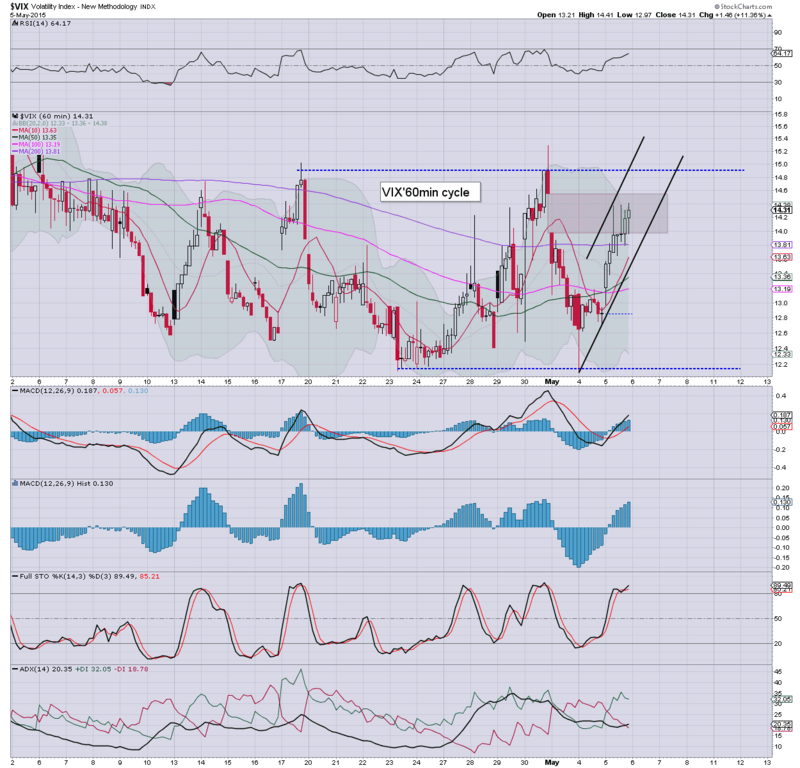 Oil is building very sig' gains of 2.9% in the $60s... headed for 67/75 this summer. Notable overnight upset... China, -4.1% overnight.... first stop is 4K.. which is another 5% lower. 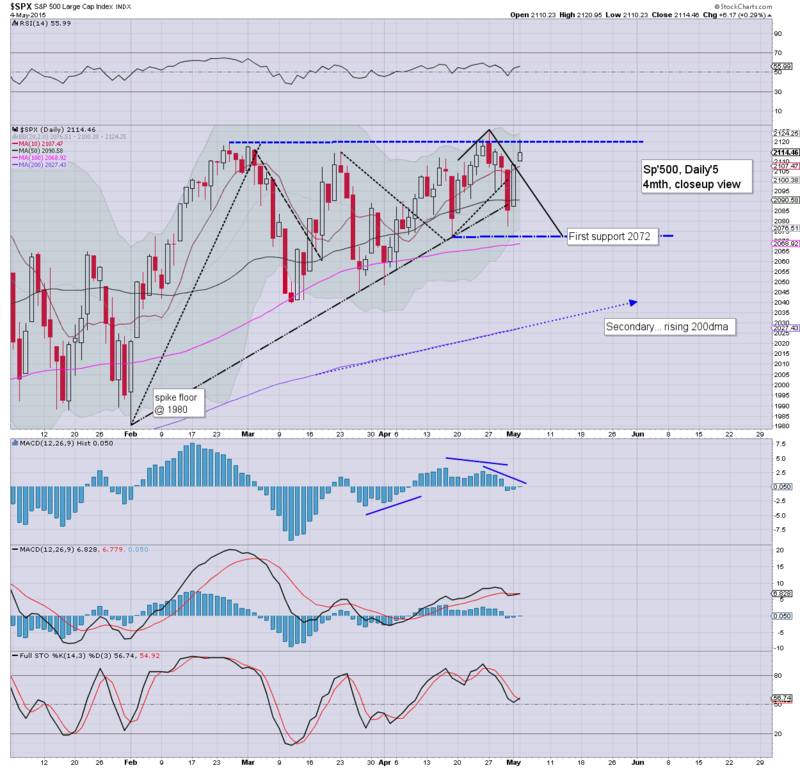 re; sp'500.... there is a minor gap in the 2090/85 zone (which would likely equate to VIX 15s)... I suppose we could slip to there... before the next push upward...but really... we're still only talking about minor down waves. 10.02am.. ISM/PMI service sector data both come in pretty okay... certainly nothing for the macro econ-bears to get excited about in terms of Q2 GDP. BABA -2% in the $78s.... looking real ugly... empty air to the IPO price of $68. The main market sure isn't helping. Good morning. Futures are a touch higher, sp +1pt, we're set to open at 2115. With the USD +0.2% @ DXY 95.60s, metals are still managing to bounce, Gold +$2. 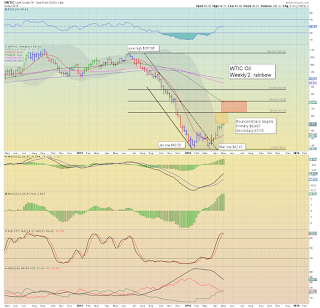 Oil is +1.8%, having broken above the key $60 threshold. *next target for Oil is $67. Most bullish target by late summer is $75. I do not see Oil managing to sustain the 70s for long. 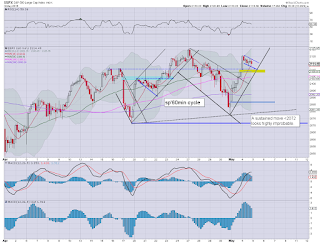 Market looks set to battle higher, again, we're now setting up for 'will good news be good news' this Friday. Weekly cycles are offering the sp'2140s in the near term. notable early gains, DIS +2% in the $113s (intra high so far 114.77). Earnings beat on just about every metric.... outlook is hyper bullish. 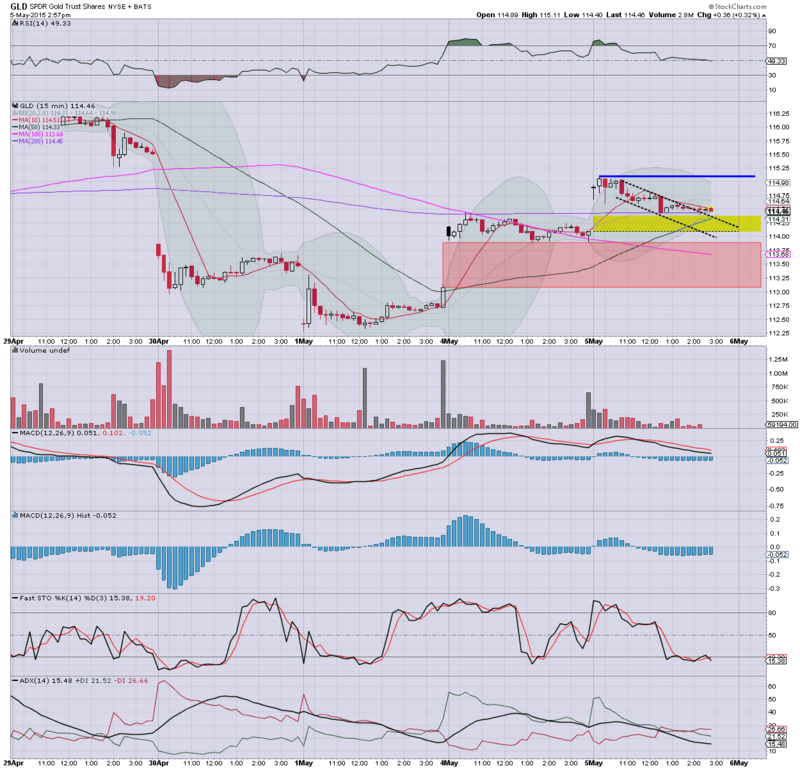 DISCA, +4.6% on earnings.... but now approaching key resistance. US bonds started the week on a negative note, with the widely recognised bond fund of TLT settling lower by -0.9% @ $122.83. 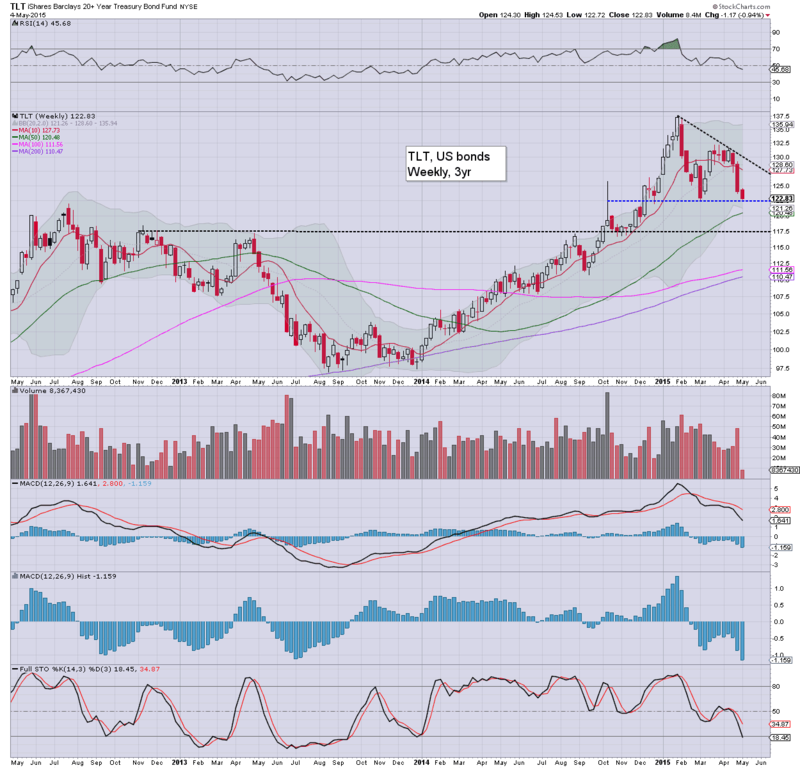 Next support is the March low of $122.46.. if that fails to hold, then TLT will be headed for 117. However, price structure is arguably a bullish pennant.. offering new highs in the 140s by late summer. *I rarely comment/highlight bonds.. but increasingly intend to, as we proceed into the summer/autumn. My broad outlook is for one last multi-month up cycle for bonds. 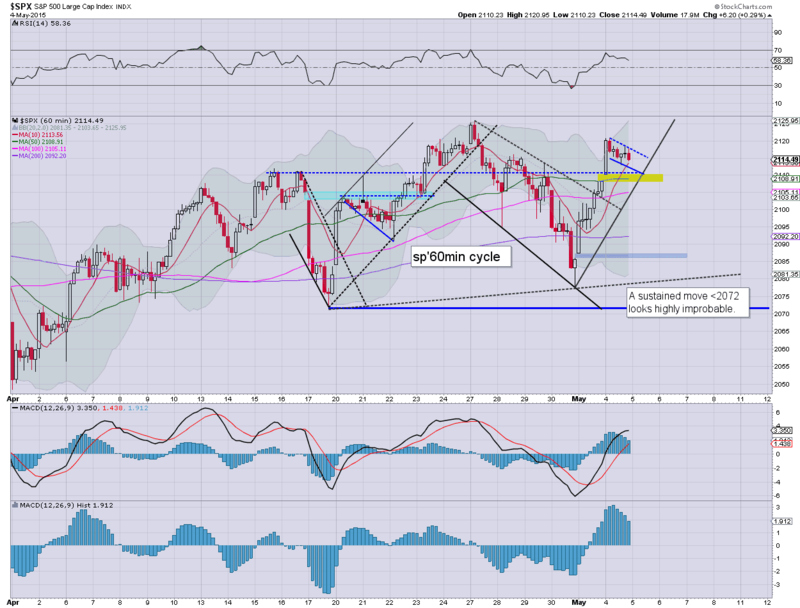 The weekly cycle is offering a double floor in the 123/22s. It will be important to recognise if this level fails to hold... more viable after the next jobs data. 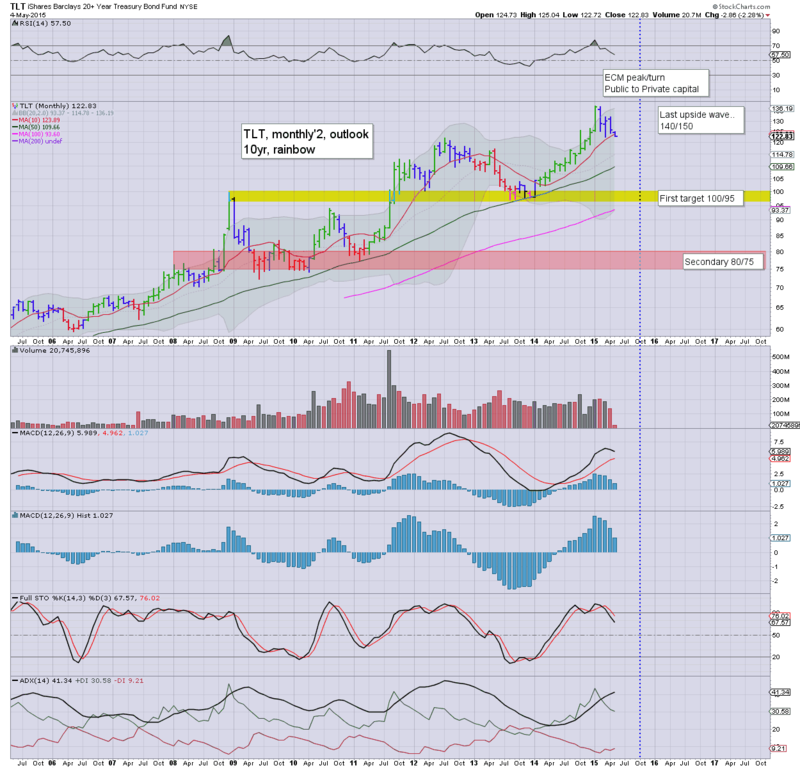 The giant monthly cycle is offering a large bull flag/pennant, with the 140/50s viable by Aug/Oct time frame. **I've never actually traded TLT, but will be seeking to short US bonds later this summer/early autumn... preferably in the 140/150 zone. First downside target would be the 100/95 zone. Many are still dismissive that the fed will be willing (never mind able) to raise rates EVER again. Personally, from late last year I had expected a rate rise between March/June.. but am now resigned to it happening no earlier than Sept. If the broader market is stable.. with US GDP at least +2%... and regular monthly jobs gains of +200K, then the Fed will be under strong pressure to at least raise rates to 0.25% from the current 'target zone of 0-0.25%'. There is the grander issue of a Public to private capital shift - as Armstrong regularly speaks about, but for now, I'll leave it at that. 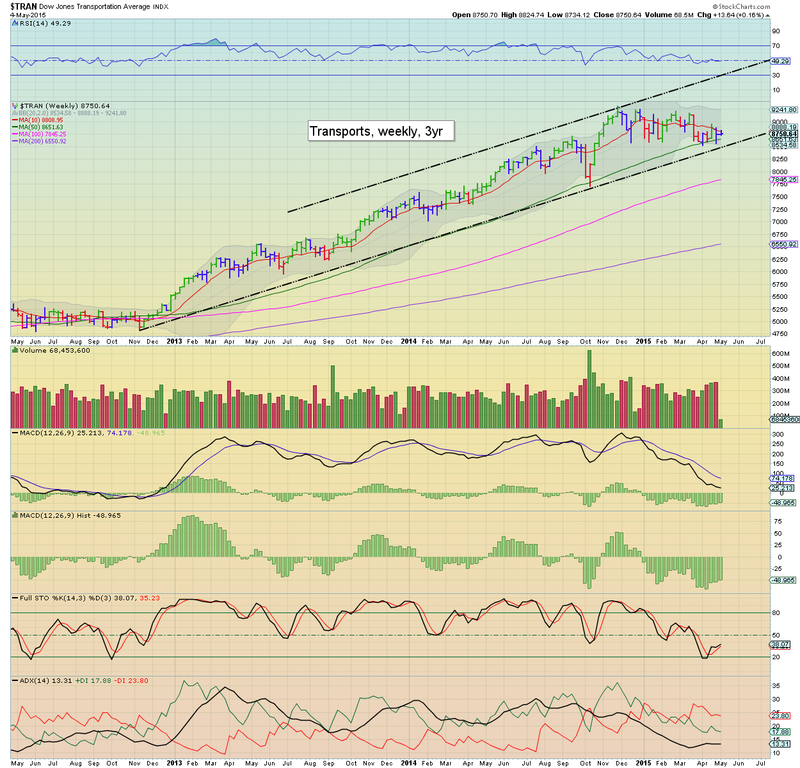 If you can agree that the Transports is indeed still the 'old leader' (after all, everything has to be transported at some point)... then the current price structure should really concern the equity doomer bears. Whilst the underlying MACD cycle has almost fully reset back to levels last seen in late 2012, prices are only a little lower than the high of 9310 (Nov' 2014). Frankly, if this was the only chart I followed as a guide for the broader market, I'd be calling for a major move higher in the next week or two. Certainly, if we see a weekly close in the 9300s, it will bode for the giant 10K threshold by late summer... which would be suggestive of sp'2250/300. I realise to some of you out there, the notion of a push higher across much of the summer is crazy talk.. after all, we're going to crash, right? I can only suggest... go stare at the above Transports chart for a good hour. Tuesday will see intl. trade, along with ISM/PMI service sector data. *Fed official Evans will be speaking around midday.. and Mr Market will no doubt be listening. Moderate gains for most indexes, but it does remain the case that the market has been broadly stuck since last December. 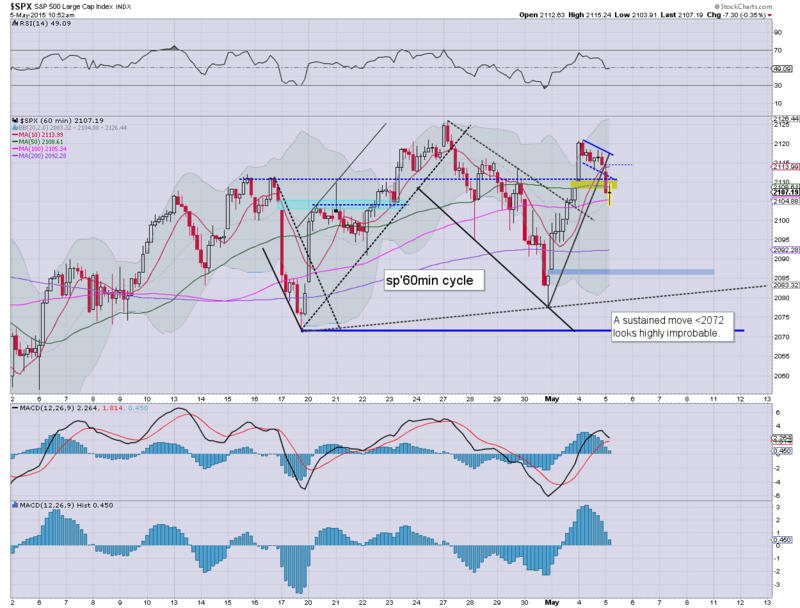 Increasingly, more are recognising that the market is coiling for a stronger move... one way or another. My guess.. it will be to the upside.. for one final up wave.. before the next sig' correction of 10/15%. For now, I see ZERO reason to be short the main indexes. The only wild card is Greece, but thats been the case since spring 2010, right?